Researched and contributed by George Seymour from the original magazine. Sitting on the bonnet of the Buick is Madam Aga Lahowska. Madam Lahowska, who is a prominent member of the Grand Opera Company, is a native of Poland, having been born in Cracow. 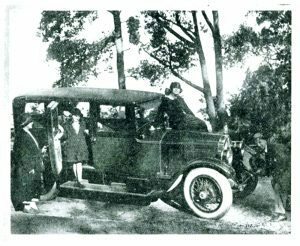 Whilst in Sydney she met fellow-countryman in the person of that talented pianist, M. Munz, who in this photograph is seen in front of the car. This photograph was specially secured for Motor Life whilst the party were on a trip to Bulli. Madam Lahowska said that the scenery around Bulli was very similar to that of the coastline near Barcelona, in which city she played the title role in Carmen.